"The breezy robustness of their musicianship is demonstrated in the joyous way the two parts switch around, colluding and colliding during the course of a tune set, adeptly maintaining listener interest while keeping feet tapping....the sisters demonstrate their awareness of contemporary styles of playing traditional material, they put their own stamp on everything they do....infectious pumping energy characterises their performance." "Hazel and Emily are engaging and talented young ladies who are getting things right. They look set to adorn the living tradition for years to come. Vote with bums on seats and hands in wallets." 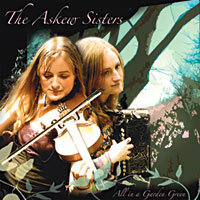 "What the Askew Sisters do so well is tell the story and allow the music accompanying to help that story-telling along. As more and more people adopt the mantle of traditional music, it is wonderful to see how they treat the material with respect and are prepared to put in hard work researching and collating songs and tunes." "The big surprise when you see the sisters live is just how big a sound comes out of two small young women and this feeling is renewed by the impression made by this impressive debut CD." "Erudite and informative sleeve notes confirm that the lasses know well and respect our wonderful English traditional music."